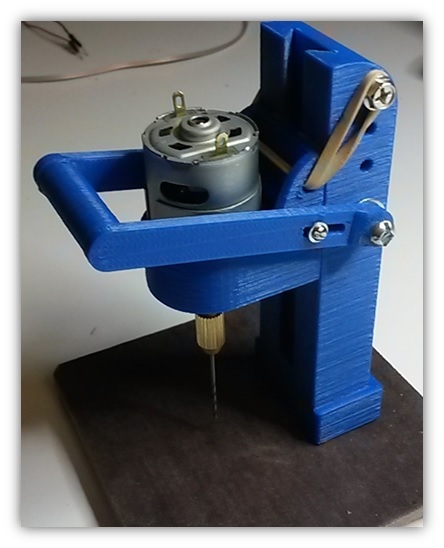 There are lots of designs for making a circuit board drill press for PCB fabrication. I thought I would try one. Drilling holes in printed circuit boards can be a challenge for hobbyists. The holes are really small, typically 0.8 mm diameter. Also, placement needs to be quite accurate. You want the hole right in the middle of a small copper pad. So far, I have used a twist drill which is worked by hand. If you are not careful, it is all too easy to break the tiny bit. Even a simple PCB may have 20 or 30 holes. An Archimedes drill may take 15-20 pushes per hole. Mind numbing work. E-bay is full of ads for “PCB mini drill press”. Mostly, these cost between $10-$15 and come with a few bits. These electric motors run on 5 to 12 volts, and may turn at 10-20,000 revolutions per minute. I ordered one from Vangel. It comes with a collection of 0.8 to 1.5 mm bits. The motor’s diameter is around 28 mm. My first attempt uses a design from Thingiverse. A maker named Zezo published a design that looked easy. It uses a plastic gantry rather than metal rods and bearings. The whole project cost me around $15 including the drill and plastic parts. Check out this video of the drill press in action. Firstly, the vertical holder needed some sanding and filing to get a smooth fit. So did the motor mount. Second, the holes in the handles needed to be reamed out so that they would move freely on the mounting screws. Third, I fabricated some additional parts for ease of mounting. This includes a support block for the base. The base is just a piece of particle board. The weakness of this design is that holes can only be drilled within one inch of each side of the PCB. The good news is that it is fast to build and works. With a bit of careful sanding and selection of the right elastic band, everything rolls smoothly. Mine is printed with PLA.